Clouds are formed by rising warm, wet air. In midair where the atmospheric pressure is low, the air expands, causing its temperature to drop and the amount of water vapor that the air can hold to fall (a reduction in saturated vapor pressure). Water vapor then condenses on particles in the air (aerosols) to form water droplets; together, these droplets form a cloud. This roughly explains how clouds develop. However, according to Associate Professor Hiroaki Miura, “Clouds are full of mystery.” One reason for this has to do with the condensation heating, which is released when water vapor condenses to liquid water, he points out. Another mystery emerges at the edge of clouds. Just above cumulonimbus, wet air from the cloud is mixed with dry air in the atmosphere surrounding the cloud and absorbs the heat of vaporization as it becomes drier. Although this results in the formation of downflow that inhibits cloud formation, this process, too, is totally unclear. Even in a broad sense, certain aspects of clouds remain unknown. When the Earth is examined on a scale of years, it is found that clouds develop around the same time of the year near the same place, year after year. This is unquestionably because of the atmospheric and oceanic response to the input of thermal energy from the sun, but again we hardly understand the mechanism that balances the input and output of energy. Computer simulation is essential when studying Earth's atmosphere, which cannot be recreated in a laboratory room. Professor Miura’s research projects are supported by the Earth Simulator at JAMSTEC and the FX10 Supercomputer at the University of Tokyo. “Around 2005, when I was working with the Earth Simulator, I was probably the researcher who was using supercomputers for this purpose the most of anyone in the world. This tells how beneficial Japan’s computer resources are. Simulation suits Japanese people, many of whom like miniature gardens and bonsai trees. I also enjoyed simulation games such as Nobunaga's Ambition and SimCity,” he says with a smile. However, he is far from being satisfied with the current situation. “It is meaningless if you cannot tie computational results to science. American researchers are better at using computational findings to construct theoretical frameworks,” says Professor Miura, showing some concern. His words are backed up by his own experience. At a scientific meeting held in the United States, Miura, then a graduate student, was overwhelmed by the number and depth of questions asked by American researchers and was amazed at their ability to deepen knowledge while enjoying discussion. Although it has not been long since his laboratory was established, the Professor Miura does not put any pressure on himself. Chia Rui Ong, a first-year master’s (M1) student from Malaysia, is good with mathematics. Professor Miura praises the student’s talent sincerely and says straightforwardly, “When working toward truth in science, nothing else, including nationality and age, matters. Everyone is equal.” Another M1 student, Tamaki Suematsu, is a returnee from the United States, where she lived for nearly 7 years and attended elementary and junior high school. The laboratory is indeed international. Just as there are no borders in the atmosphere, research has no borders. In the 1960s, researchers who supported the studies on general circulation models in the United States were none other than Japanese researchers who excelled in mathematics and building theories. Japanese researchers can lead the world if their sophistication, as seen with their preference toward things like miniature gardens and simulation games, is combined with the ability to construct theories. I think what gradually follows is the elusive, yet real, picture of clouds. 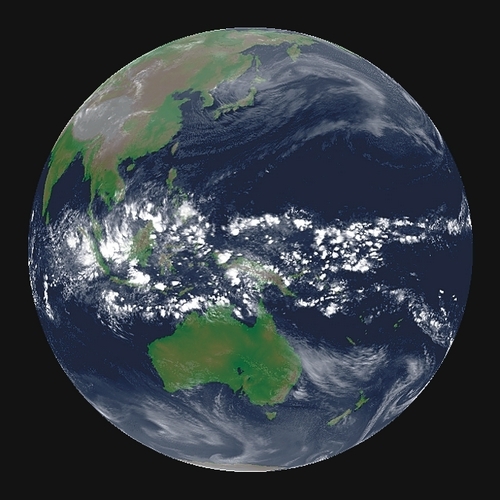 Using the Earth Simulator, Professor Miura recreated the clouds associated with the Madden–Julian oscillation observed in the tropics. The results of the study were published in the December 14, 2007 issue of Science, the academic journal of the American Association of the Advancement of Science.